La Quebrandona before and after. Screenshot from Noticias Caracol. 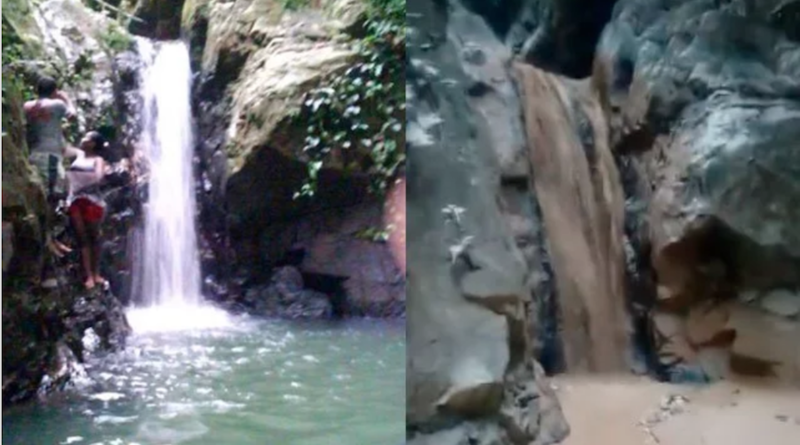 Police in the central northwestern department of Antioquia and the Regional Autonomous Corporation of Antioquia Corantioquia announced that they will take urgent measures to protect a waterfall called La Quebrandona, located in the Zaragoza municipality. The officials’ reaction comes in response to a citizen’s video that went viral and was reproduced on national television. The recording shows a local visitor crying at the natural site as she discovers that the water went from pristine blue to muddy brown. The woman blames gold miners for polluting the area. According to Noticias Caracol, following the release of the video, Corantioquia, which oversees all environmental matters in the region, visited La Quebrandona together with the police and took sediment samples to further investigate the causes of the disaster. The agency’s deputy director, Carlos Naranjo, told the broadcaster that the type of sediment found there is evidence of illegal mining activities, however, he said that they could not find workers or heavy machinery in the area. Still, police are going to start a campaign to try to find and arrest the people who caused the damage. “Only by completely halting illegal mining we will be able to restore water quality and allow the waterfall to go back to its natural course,” Naranjo said. A 2017 report by Colombia’s General Comptroller revealed that 80% of mining operations in the South American country are illegal. The report blames such activities for the widespread devastation of important natural sites.